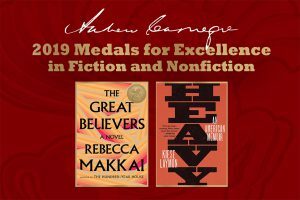 The American Library Association has selected The Great Believers by Rebecca Makkai as the winner of the 2019 Andrew Carnegie Medal for Excellence in Fiction, and Heavy: An American Memoir by Kiese Laymon as the winner of the 2019 Andrew Carnegie Medal for Excellence in Nonfiction. The selections were announced January 27, 2019, at the Reference and User Services Association’s (RUSA) Book and Media Awards, sponsored by NoveList, during the ALA Midwinter Meeting & Exhibits at the Washington State Convention Center in Seattle. Makkai’s novel explores the complexities of friendship, family, art, fear, and love in WWI-era and present-day Paris and 1980s Chicago while illuminating the early days of the AIDS epidemic. In his memoir, writing professor Laymon recalls the traumas of his Mississippi youth: the depthless hunger that elevated his weight; his obsessive, corrective regime of diet and exercise; and his gambling, teaching, activism, and trust in the power of writing. More information on the awards can be found at http://www.ala.org/carnegieadult.